My ongoing series of smart-phone enabled photo posts. For our family, August means a series of days sweating in a hog barn. First up for us is the Ohio State Fair followed quickly by the Indiana State Fair and our county fair over Labor Day weekend. No matter how hot the people get, pig comfort comes first. 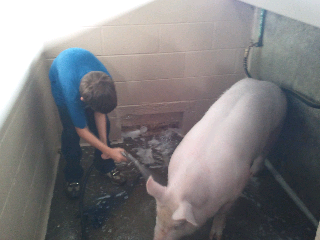 In the photo, Ryan gives a "bath" and welcome cool down to his Yorkshire gilt.